One of the greatest things with publishing your writings on the web is that the most unlikely individuals can contact you and give you feedback. A few months after my 1st RESISTENCIA-review was published on Metal Treasures, I got an e-mail from guitarist and founding member, Marco T. Ciargo. He was happy to find some fans of his old band and I was more than happy to hear from a member of what was probably the best of all old Latin American Metal bands, not to mention one of the first and most influencial! If you are oblivious to these mighty Venezuelan masters I suggest you read my review on their debut LP in the Vinyl-section and take a trip to their website. Dig that luwly NWOBHM-sound? Put their albums on the top of your wantlist and go fish! October 2002: You've just finished a RESISTENCIA web page, which looks great. We're eagerly awaiting an English version! But why now, at this time? Are you planning to reform the band? No, we' re not planning to reform the band at the moment, but you never know. I really thank you. I' m pleased you liked the web page, it' s my first one. The reason why I made it is simply because I thought it was the right thing to do. Your old vinyls are becoming increasingly difficult to find over here. Are you planning to do any CD or vinyl re-releases? I would guess a few Metal labels would be interested. Our records are "impossible" to find since the end of the 90's. I'm very pleased to know that some copies have reached Sweden. I would willingly accept a good Metal label offer to reedit our records.You told me about a live bootleg CD. Who released it? Is it still available? It's an old tape in good condition that I rediscovered 6 months ago of a 1982 Caracas concert. I wanted to transfer it to CD-R because it's a testimonial to the energy that RESISTENCIA had when performing live. It is not for sale. You were one of the heaviest, if not the heaviest band around in this time and part of the world. Did you have an ambition to be "The Heaviest Band In South America"? What musical influences did you have? When we started, internet was only a dream and there was a great lack of information between South American countries, therefore we didn' t know what was happening in other places and vice versa, but certainly, we were the heaviest band in Venezuela. We all often met to listen to records, and the most significant were: Moving Pictures (Rush), Unleashed in the East and British Steel (Judas Priest), Heaven and Hell (Black Sabbath), Tokyo Tapes (Scorpions) and Killers (Iron Maiden). Every single one of us comes from the old 70' bands: Led Zeppelin, Deep Purple, Uriah Heep, Grand Funk Railroad, etc. Just how "big" where RESISTENCIA in the early 80's? Did you sell hundreds of thousands of records and play huge arenas, or were you more of an underground band? We sold thousands of records and when we played live we filled football and baseball stadiums, plazas de toro, theatres, amphitheatres and pubs. 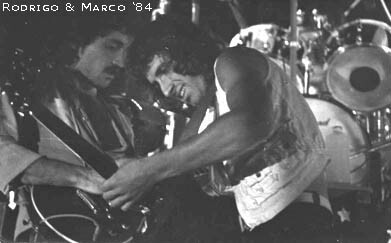 >Was it hard to play Heavy Metal in Venezuela in the early 80's? How was the political climate? Did you have any trouble with the authorities? Yes, it was quite hard to start in a country were places to play rock music didn't exist. We had to face the situation to have the possibility to change it. The political climate then wasn't so negative as now, even if the authorities were always present and active during the concerts, and I remember that once they suspended our show. The 2nd and 3rd album lyrics had social and political subjects while in the first album had a more mystical subject. So far I have only got your 1st album. I did get a chance to listen to your 3rd and last, which sounded less heavy and more prog'-influenced. Why this direction? We always followed our instincts when composing our music; it was a natural evolution, not a conscious desicion, and anyway there was already a progressive presence as early as the 2nd album. I can hardly do a RESISTENCIA interview without mentioning the other great old Venezuelan Heavy Metal Gods ARKANGEL. You were active at the same time. What relation did you have to them? Did you play alot together? Or was there some competition? We contemporarily signed for the same label, COLOR. Our band comes from Caracas, while they come from Valencia. Media wanted us to be rival bands but we were not actually. I think we played only once together, and I heard that Arkangel's lead singer says he's always been a fan of Resistencia. Were there any other bands from Venezuela who played this heavy music at this time? Any records we should know about? Enlighten us hungry collectors! I'm afraid there are not, or not many anyway, and I don' t think they've ever made any records. Why did RESISTENCIA break up? It wasn't easy living on Rock in a country like Venezuela. We where ahead of our time and we didn't see the results we expected. What have you been doing since then? Have you played with any other bands? I decided to settle in Florence, continuing to find my own niche in the music world. I've prepared and given courses in creative devolopment in a music school and I've played in variuos groups, the most interesting of which was SUONI DI FUORI, my first experience with a female vocalist. How come you've moved to italy? Was it because of their great metal scene;-)? My parents are Italian. South America is isolated from the rest of the world and moving to Italy represented a door to the world. Next year I' ll moving to Spain where the Rock scene is more effervescent than in Italy. Do you have any contact with the other band members? Do you know what they have been doing/are doing now? Of couse. I'm in contact especially with Luìs, Ricardo and Nicky (the new guitar player). They still play sporadically. Luìs moved to Spain 2 years ago and Aquiles took his place on the bass. I've been trying to get in touch with Rodrigo, but haven' t heard from him at all. I heard from Cèsar 2 years ago...he' s very lazy. Do you still listen to Hard Rock/Heavy Metal? What's your view on the state of HM today? I've grown away from Heavy Metal and am more into Hard Rock. Right now Glenn Hugues is a good point of reference for me. I guess alot of collectors would be interested in the editions of the albums. How many copies were made of each LP? Any colored vinyls or picture discs? Different versions/pressings? Any singles? I think we never will know exactly the number of copies we sold. I have been asking the others members of Resistencia in Venezuela if they know the exactly copies we sold, but they really don' t know. They told me about 10.000 copies for all the 3 LPs, obviusly Hecho en Venezuela had sold much more than the other one. There aren't either singles nor coloured vinyls or picture disc. Two versions have been made for the 1st record, but only the first one as a fold-out album. October 2003: Well, I finally got hold of all your vinyls:-D. I have to say 2nd LP "Estrategia..." is my favourite. A perfect blend of heaviness, epics and technicality. What is your own opinion of your old work today? Does it stand the test of time? Which are your favourite LP and songs? I'm joyfully impressed that you have manged to get of them; it's incredible! "Estrategia..." was the one that took us the longest to record; in fact, we did take it slowly 4 or 5 months, 24 hour of day. It was recorded at our sound technician's studio (his name is Josè Ferreira), in only 8 tracks, insted of 24 of "Hecho en Venezuela" or the 32 of "Dacapo". In it, you'll find folk instruments from Venezuela ("Màs allà de la historia"), spanish and folk guitars ("Escucha el silencio"), and old electric arp (intro "Espejismo"), a big twenty litre bottle we crashed on glasses and mirrors in the bath of the studio bathroom ("Los Pana Americanos"), timbales and the sound of a coin falling to the ground ("Asì eres tù"), and also the social-political scene we were living in Venezuela then ("Fantasia, Asì eres tù"), Venezuelan history ("Màs allà de la historia"), our Pan-American brotherhood ("Los Pana Americanos") and our human inwardness ("Espejismo, Escucha el silencio and Hombres libres del mañana"). There's also a short track that is very special to me, "Preludio" which I recorded at home with a 4 track recorder, because one nigth I woke up with that melody in my mind and immediately recorded two of the four guitars. On the following day I recorded the other two, and, if you listen carefully, at the end of the song you'll hear my grandma's voice calling me for lunch ("Marco, a tavola..."). It's difficult for me to judge my own works; I'm so near and so far from them... We have been considered as the pioneers of heavy metal in Venezuela, but I didn't think it was heavy metal what we did, and I never felt like a heavy metal musician; what we did was just what we wanted to do, out of any preconceived musical context; everything was absolutely spontaneous, we simply had "Resistencia" and this is what I think will make our music go beyond time. If it wasn't like this, we wouldn't be talking about "Estrategia..." twenty years later. I don't usually listen to my own old records, and although I still consider them good works, they are a part of the past of my music. But, of course, old friends, beer, and "Estrategia... " or "Hecho en Venezuela" or "Dacapo" would be a nice combination! From what little I understood from your Biography you recorded a demo in '85 which was to become a concept album/"rock opera". Tell us about this project! What was it about? How did it sound compared to your earlier albums? This demo we made in '85 and was Ideated by Cèsar and me. We were thinking about releasing a concept album: "Zodiaco", twelve tracks for the twelve zodiac sings. We were collecting information about astrology to base the story and the music on. Each song is composed in the key of the planetary frequency of each sign. It's the story of a man who is born in a prehistoric age under the sign of Aries and reincanates in the next eleven signs in different times and characters. And for characters of Cancer, Virgo, Libra and Pisces, we used the personal characteristics of each of us. I wrote the music, except that in my fellows' signs tracks, in wich they took part, and the lyrics were written by Cèsar as always. 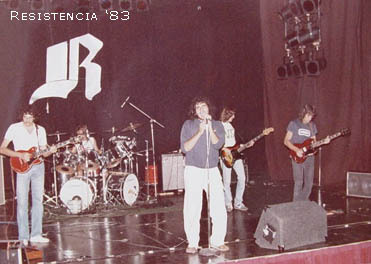 The recording of this demo was made at the same studio where "Estrategia..." was recorded. The sound if compared to the one of the old albums, is the sound of a quartet; more hard rock, less heavy. Rodrigo wasn't playing with us any more, we had problems during our last period with him. He was a fantastic guitarrist, but sometimes he was a very conflictive person. He'll always remain a friend to me, we did good things together with our guitars. The record company never considered this demo something commmercial and the contract we had with "Color", the label where we had recorded the previous albums, had come to an end and we didn't intend to go on working with them. Unfortunately, the political situation in our country didn't help us at all, and the tracks remaned to be played live only. We had started to produce "Zodiaco" as a musical to be performed in theatres, but this had to be interrupted, too... As I told you, things were getting worse all the time. ...And so in 87 an official 4th album was recorded but never released. Tell us some about the style & sound of this album! Yes, that's rigth. In 1987 we had the chance of releasing a new album and started the recording under our own production. 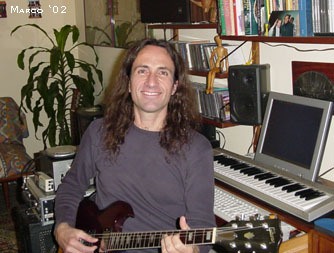 A new keyboards player had joined us: Fernando Aponte. It was the first time we proposed to compose the tracks separately and then arrange them together, and we did it so. On the record there's a song written by Luìs, another one by Ricardo, another one by Fernando, three by Cèsar and three by me. The result was a mixture of ethnic music, jazz, hard, pop... There was a violin, a choir formed by twenty children, a piano, a sax, congas and other percussions played by a guest artits, and female backing vocalists. As ever and fortunately, we worked with a total creative freedom. The album was already to be mixed, but that was the year when we split up. The tape was last in time, and we only have a copy that was hastily mixed, with voices and musical arrangements missing in some of the songs. You live in Madrid now. How's the rock scene there? Tell us about this rock-school you are starting and what your goal is? That's rigth, I' ve been living in Madrid since March. Florence is a lovely place that helped me raise my family in an atmosphere surrounded by beauty and peacefulness, where I'm able to keep on devoloping my own style, technique and musical taste. But my son is already fifteen years old and my wife and I decided to give a new impulse to our lives; it was time for a change. We had visited Madrid some years before, and from the first moment we considered it as an excellent possibility for changing our residence; a possibility that has taken five years to mature. About the purpose of the rock music school I intendet to start soon, it's to offer the students an alternative of study, having the choice of learning by developing their own personality and by stimulating their creativity, based on a system far away from traditional didactic teaching, that does not let the student devolop his or her own style and qualities. Spain has a good rock scene (especially in Madrid and Barcelona), and the fact is that you have the chance to go to concerts every day; this is quite positive. That's the way I'm preparing myself to go out to perform at nigth. Luìs is living in the outskirts of Madrid, so we considering the possibility of playing together again. Thanx alot for your time and trouble, Marco!